Kuopio is a city and a municipality located in the region of Northern Savonia, Finland. Attractions like Nokkakivi Amusement Park and Treetop Adventure Park make great kid-friendly stops. 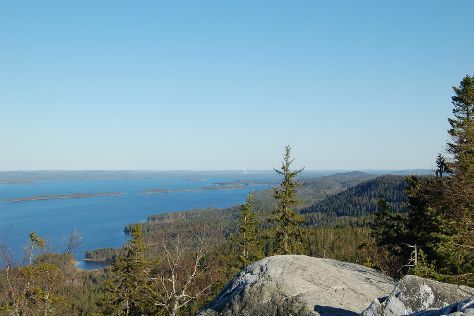 Explore Kuopio's surroundings by going to Koli National Park (Ukko-Koli Hill, Kasken Kierros Nature Trail, & more), Koli Nature Centre Ukko (in Koli) and Jyvaskyla (Kuokkalan kartano, Keski-Suomen museo (Museum of Central Finland), & more). Spend the 27th (Sat) exploring nature at Tiilikkajarven Kansallispuisto. Spend the 10th (Sat) exploring nature at Pyha-Hakki National Park. Next up on the itinerary: enjoy breathtaking views from Puijo Tower, take in nature's colorful creations at Botania - Botanical Garden and Tropical Butterfly Garden, don't miss a visit to Sculpture Susi Kosiomatkalla, and contemplate in the serene atmosphere at New Valamo Monastery. To find where to stay, more things to do, maps, and tourist information, use the Kuopio trip itinerary builder tool . In July, daily temperatures in Kuopio can reach 24°C, while at night they dip to 15°C. Finish your sightseeing early on the 23rd (Fri) so you can travel back home.